How does one get started on beef cheeks ? Maybe you’ve never even heard of them before. They’re certainly not what you’ll find in your local supermarket. Yet, they are rising in popularity in the restaurants of top chefs. And any sound butcher or foodie will likely know them well. Down at my favourite stall (Adrian Livesey’s Butchers) at the local market, when collecting a chicken to make this week’s bone broth, I spotted a pigs head and asked what the best thing to do with it would be. The ever friendly and informative butchers suggested pigs cheeks as a popular dish. However, they also recommended beef cheeks as they’d just got some in. 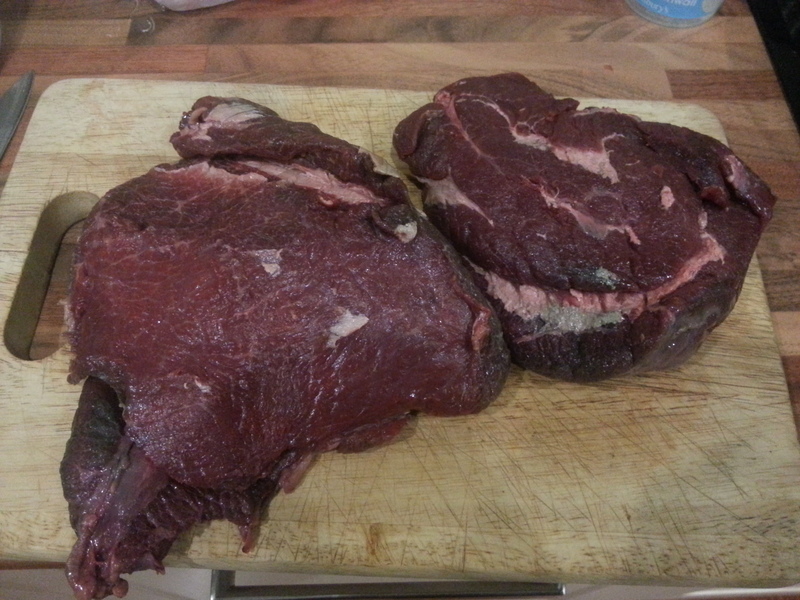 So, just by chance I ended up with 2 large beef cheeks. 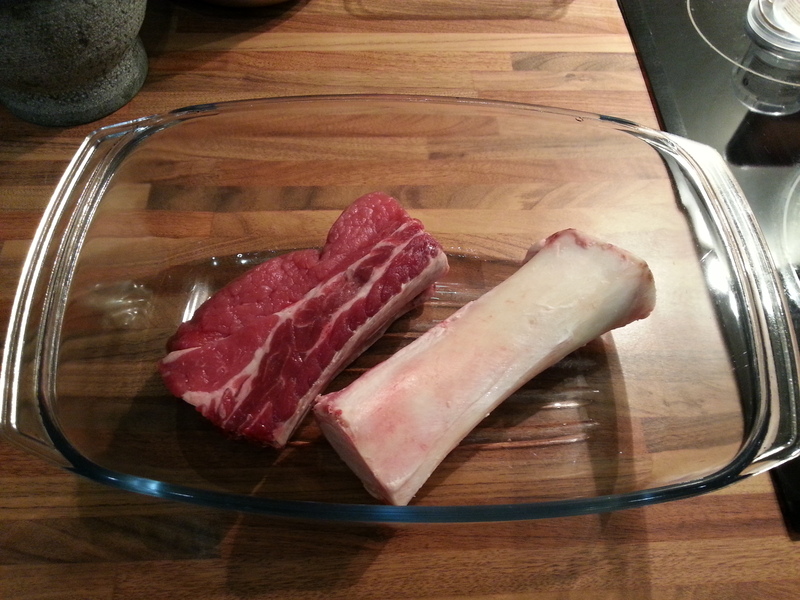 At less than a fiver, these two huge chunks of meat were a real bargain. I was taken by the recipe straight away : only 15 minutes of prep time. Right up my street. First though I had to prepare myself. The recipe called for chicken stock. However, I had just bought a marrow bone and a piece of brisket from the butcher to make some bone broth for the weekend. Bone broth is my new passion, so I’ll be posting more on that later. Simply buy bone(s) and a cheap cut of meat (brisket) and then slow cook for up to 24 hours. We brown our bones in the oven first, then transfer to a slow cooker, add onion, garlic, carrot, bay leaf, sea salt and water and leave on LOW for 12-24 hours. So, once I’d done the broth I was then able to get down to those 15 minutes of labour prepping all ingredients before returning them all to the slow cooker again for a further 12 hours. That’s a lot of work for a slow cooker, but not much for me, and I like that. The result was an impressive stew for 8 people. That works out at no more than £1.50 per portion – so quite a bargain for top class restaurant style food requiring only 15 minutes of labour and a bit of planning. 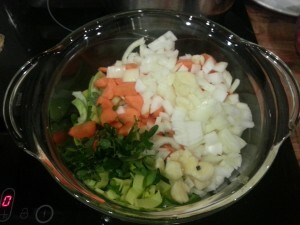 We served ours with parsley and parmesan bulgur the first night. The remainder I had later in the week for lunch with oatcakes. 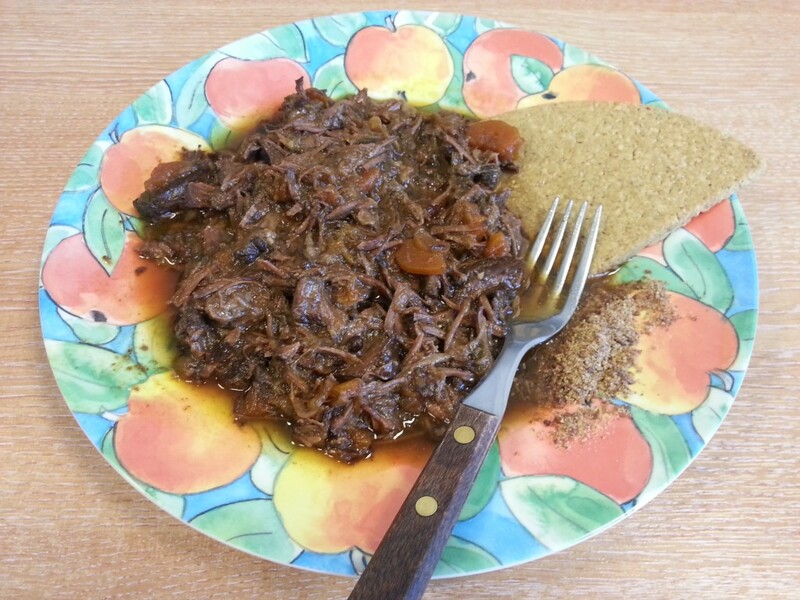 Interested in experimenting with alternative cuts of meat ? Well, here is an encouraging article about Ration-book meat cuts from the Telegraph. Read here. Another time I’ll tell you about some of the alternative ration-book meat cuts I’d regularly come across when living in the Czech Republic, the land of meat and beer.